The ridge above the state park had been slated for logging, but Western Rivers Conservancy secured the purchase of 3,700 acres of land, plus 22 miles of trails for public use. As I slowly climbed the forested hillside above Lake Wenatchee, I kept thinking about a near-death experience I had a few years ago, when a drunken driver nearly ran me off the road. I don’t normally think about near-misses like that on a forest walk, but in this case, the trees around me had just survived a close call of their own. 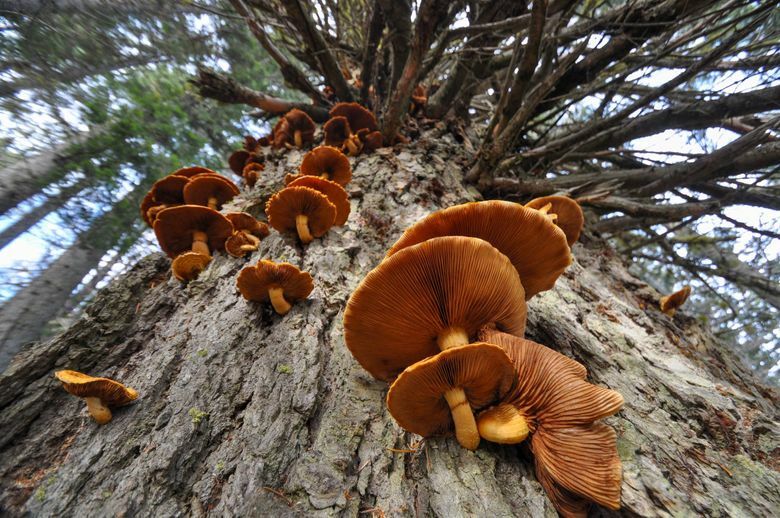 Last summer, hikers on the popular Nason Ridge trail were alarmed to find signs indicating that Weyerhaeuser had slated the area for a massive commercial timber harvest. 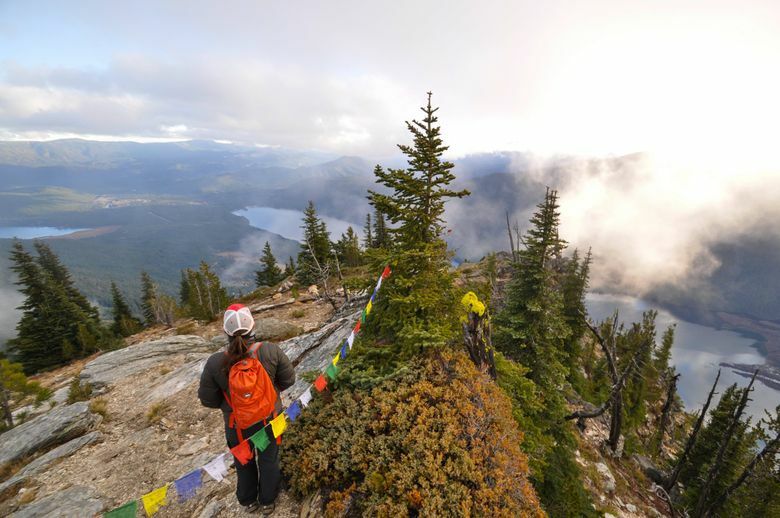 The ridge directly above Lake Wenatchee State Park is frequently explored by hikers, bikers, skiers and equestrians. A ravaged hillside would have ruined the experience — not to mention the views — for the thousands of park visitors and lake residents. But this summer, Western Rivers Conservancy stepped in and secured the purchase of the property, pausing the deforestation and preserving 3,700 acres, plus 22 miles of trails for public use — before all were lost for a generation. I wanted to see firsthand what was almost sacrificed to the chain saw, so I took my 3-year-old son, Ian, on an early fall hike up the Nason Ridge Trail. What I learned was that the moderate wander is a terrific component of the slate of trails dotting Lake Wenatchee. The most convenient access begins at Kahler Glen Golf Course (Northwest Forest Pass required). From the trailhead, we meandered through fairly flat wooded terrain for a half-mile, then began slowly ascending the hillside. We were the only people on the trail that day, but tracks on the sandy path reminded me that it’s open to many modes of travel: horseback, dirt bikes and mountain bikes — if you like the challenge of a three-mile single-track climb. In the winter, it’s also a sweet snowshoe trail, and Nason Ridge offers one of the area’s more challenging Nordic ski destinations with a 13-kilometer loop. After the first mile, we were soon looking down on the state park, so we ate lunch and watched the paddle-boarders circling pristine little Emerald Island just outside the park’s swimming area. They looked like tiny colorful insects from our vantage point. The higher we climbed, the more we enjoyed views of austere Dirty Face peak (see below for hiking details), Fish Lake and the Entiat Mountains, still smoldering from summer wildfires. While I enjoyed the scenery, Ian was far more focused on finding a cougar spotted on the trail the previous morning. Black bears are also frequent visitors, and friends of mine even reported a moose encounter while biking this summer. Sue Doroff, president of Western Rivers Conservancy, says that it was important to protect Nason Creek as it runs along the toe of the ridge. “It’s a tributary to the Wenatchee River which has critically important fish runs and has been the focus of targeted investment from multiple agencies and the tribe,” she says. 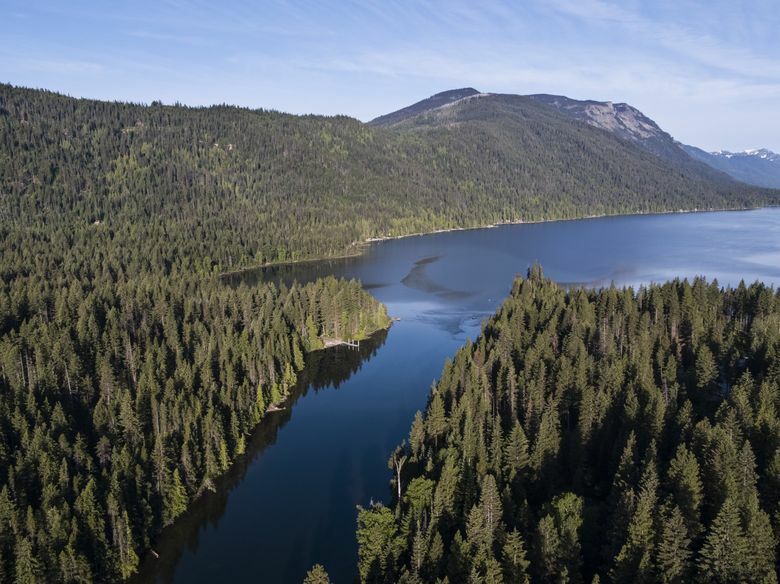 WRC has partnered with Chelan-Douglas Land Trust to raise $1 million to support the sale, and they plan to keep Nason Ridge open to the public and select a long-term steward to manage the property. “Our mission is to protect land along rivers for the benefit of fish, wildlife and people, and Nason Ridge hits the trifecta for that,” says Doroff. 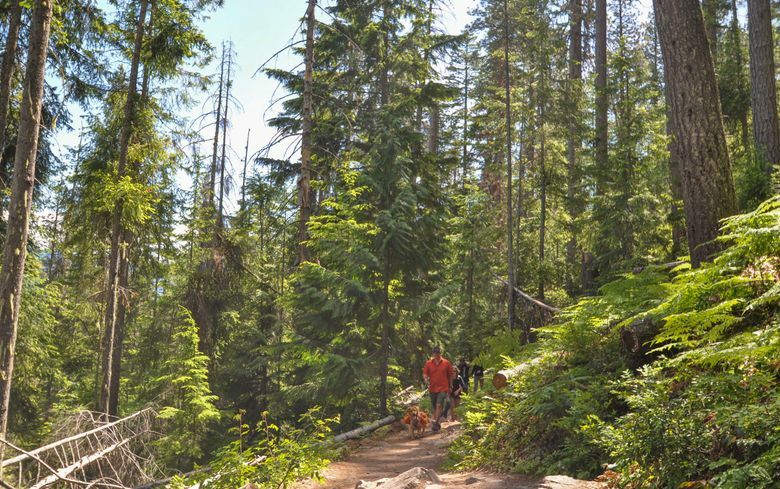 Over a total 22 miles, the Nason Ridge trail accesses Rock Mountain, Merritt Lake, Lost Lake and Alpine Lookout — the only fire lookout still in use in the Stevens Pass area. About two miles into the hike, Ian and I paused at “Big Red,” a huge ponderosa pine and a common stopping point for snowshoers and hikers. Ian hugged the giant tree for a photo and was dwarfed by it. The tree has probably stood there for hundreds of years. 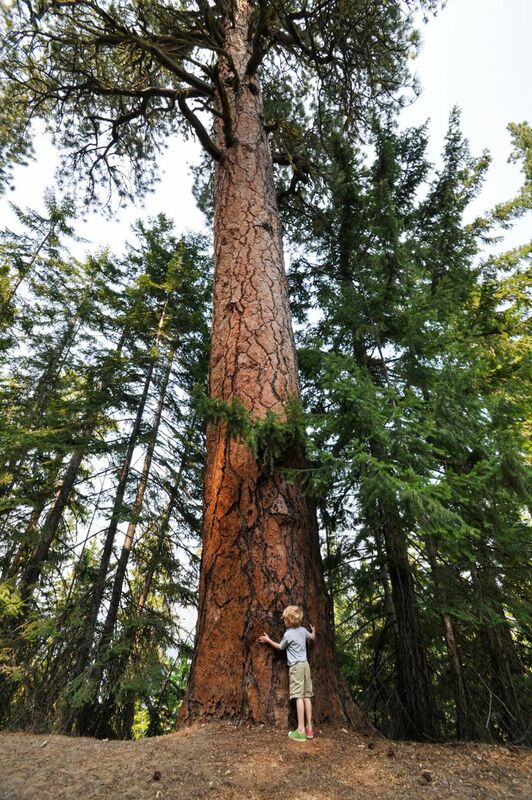 I was glad to know that future generations will have the chance to meet the old-growth giant in person. Nason Ridge is by no means the only trail in the area. 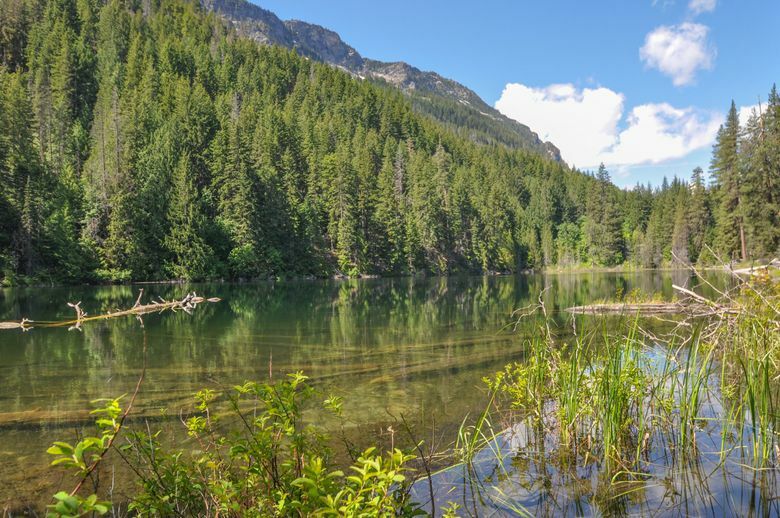 The Lake Wenatchee area is dotted with good hikes for all levels. While most are steep, one of the easier favorites — especially good for young hikers — is Hidden Lake, 1.6 miles round-trip. Starting near Glacier View Campground (Northwest Forest Pass Required), the trail climbs gradually among pine, cedar and fir trees, and you’re frequently greeted by pileated woodpeckers. The trail crests, and suddenly a quaint lake pops into view. This is a nice payoff for little effort and a good reward for the proud kids who conquer this trail. The shallow shoreline is also a good place to hunt for frogs and snakes. While it may look like you can walk around the lake, it requires some serious bushwhacking. 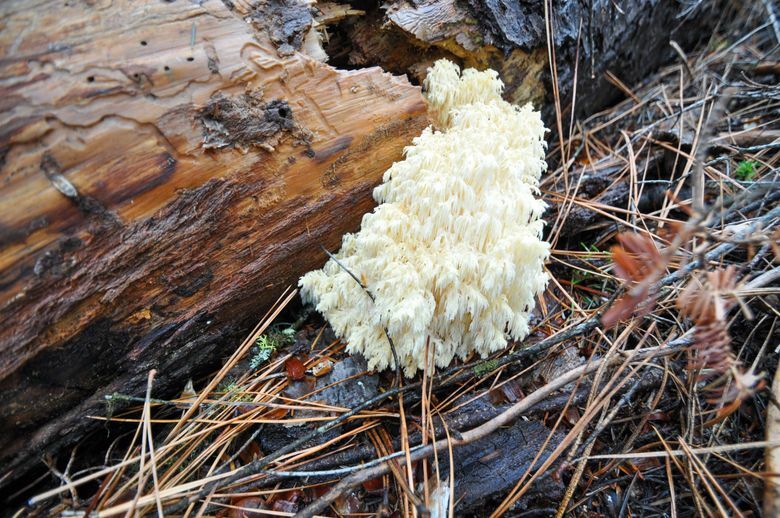 Instead, cross the small exit stream and walk a few minutes to an open area where a jumbo ponderosa pine has fallen into the lake. You can climb out onto the trunk. For more of a challenge, try Dirty Face Peak. You can see Dirty Face peak from anywhere on Lake Wenatchee. It almost begs to be climbed, though the leg-burning effort isn’t for the faint of heart. But for those who scale 4,000 feet of elevation in 4.5 miles, the views are hard to beat. Park at the Lake Wenatchee Ranger Station on the east side of the lake (Northwest Forest Pass required). The first mile is fairly gradual, and the waterfall after 700 feet of gain is a good turnaround spot. 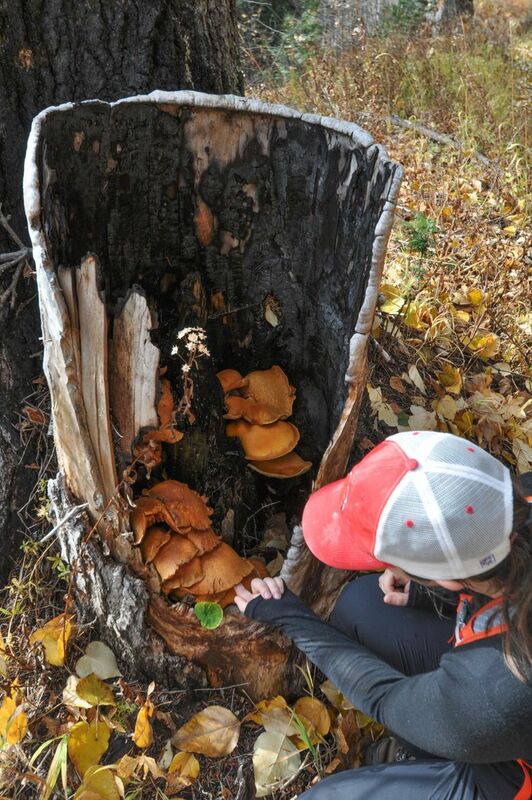 Switchback up the steeper sections, and you’ll encounter panoramas of fall color and excellent mushroom hunting. Eventually, Fish Lake comes into view, and large swaths of the Wenatchee Valley emerge the higher you climb. At the top, there’s an old fire lookout and a reward: a 360-degree view. 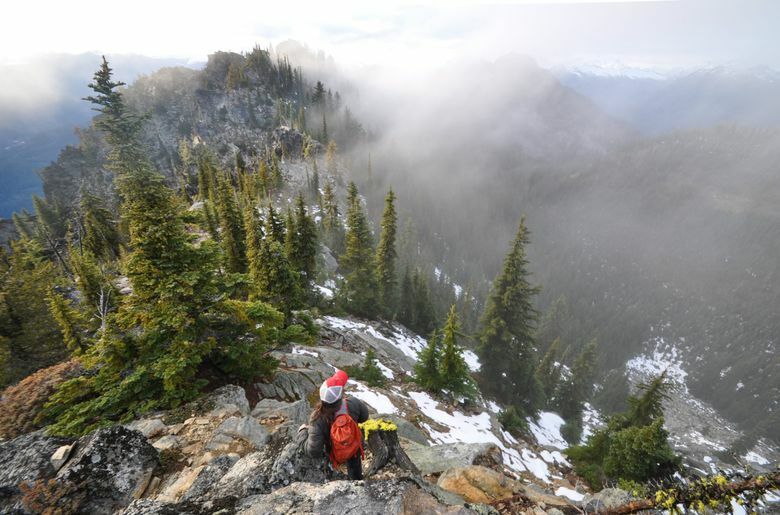 On a clear day, you can see into the reaches of the North Cascades, The Enchantments, the snowy ridges within the Glacier Peak Wilderness, and recently preserved Nason Ridge. 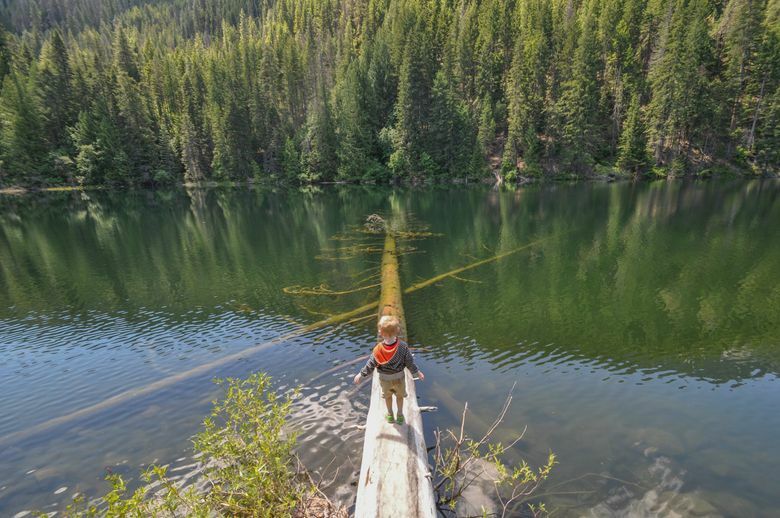 But for me, the best view is the one straight down onto Lake Wenatchee, where it feels like you could take a step and (with the aid of a parachute or flying-squirrel suit) land directly in the lake. Most trailhead parking requires a Northwest Forest Pass. The effort to save Nason Ridge isn’t finished. Logging has been paused but fundraising is still underway. The Chelan-Douglas Land Trust is raising $1 million from the local community to support the sale. To learn more or donate, visit savenasonridge.org.